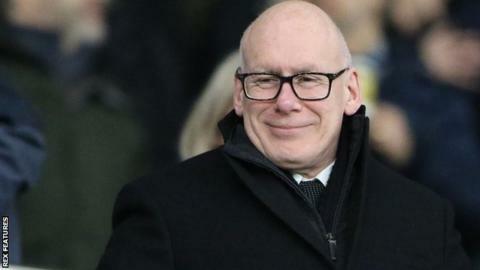 Derby County owner Mel Morris remains keen to attract investment and open to offers for the Championship club. Morris has previously said he is willing to listen to offers but Derby have refused to comment on new reports he is increasingly eager to sell up. He said in August that he will always act in the club's "best interests" and is "open-minded" about bringing in further investment. Morris completed his takeover of the Rams in September 2015. Frank Lampard's side are eighth in the Championship, one point off the play-off places and with a game in hand on all but one of the sides above them. They have not been in the Premier League since the 2007-08 campaign, when they were relegated with a record-low points tally of 11. It's perhaps no surprise Mel Morris is stepping up his search for new investment, and possibly an outright buyer, given reports he's losing up to £2m a month financing the club. He's continually invested to fulfil his dream of reaching the Premier League but warned last year - after losing money for nine successive years - that "the current levels are not sustainable, it's impossible to spend at the level we have year after year." It's thought there's interest from the United States and the Far East since Morris said he'd welcome fresh investment, and there's a growing feeling that may well happen sooner rather than later.